Here it is! Move-in ready: 3 bedroom, 2 bath with cul de sac location and open floor plan! 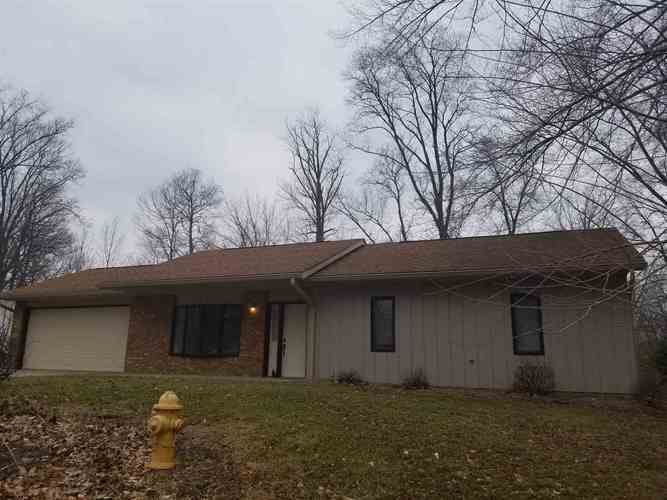 Long established neighborhood that’s just a 10min drive to downtown Bloomington. Home has lots of Kitchen cabinets and large open living & dining area. Attached 2 car garage with room on the side lot for additional growth space and chain link fenced backyard area. Lot lines are beyond the fence. Seller is offering a $2,000 Flooring allowance to buyer at closing! Seller’s improvements are: 2006 Refrigerator; 2007 Roof; 2010 HVAC; 2016 Fence, door into house from garage, cabinet hardware, sink faucet & dishwasher; 2017 hot water heater & laminate wood floors; 2018 garage door & new fan in master bedroom. Directions:West on 46. Turn Left onto Ridgewood, into Westbrook downs. Veer to the right. Turn Left onto Brookwood. This home is at the back of the neighborhood on the right in the cul de sac. Listing provided courtesy of Reeves Realty Services LLC.